It’s time to go back to old, boring, studious life where you have to leave the bed early and go to bed early. 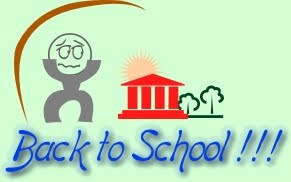 It’s time to go back to schools, as most of the institutes in Punjab are reopening from 1st September, 2009 after the vacations of 3 months or so. Students feel miserable when they think of ending up with fun filled, relax, chilling life without the stress of assignments, projects, home works, and presentations. Now again there would be no music but teachers lectures, no novels but course books, no movies but horrible presentations, no chatting but assignments and home works. But at least one thing will be to blissful and cheer for and that is that we’ll be meeting our friends and fellows and welcoming our juniors. Some would be happy and excited for their new colleges or universities. Thanks to Punjab Government, if they had not put their efforts, we would have been back to our schools for two or three weeks ago. Punjab Government issued the orders to all the educational institutions to remain closed till 31st August, 2009. If they won’t have been there, we will not be having 2 or 3 more relaxing weeks, instead we would have been going to our institutes in blistering sun and aggravation of load shedding. These unexpected extra vacations are gift to all the students from Punjab Government, so we all thank them for such an act of kindness. Our Government has really put full effort for this, they made surprise visits to the school to keep check, if they found or heard of any school opened, they went there and inquest them.